The blood pressure is an evident about several internal bodily functions of a patient that tells us about various changes in the patient’s body. Blood pressure measurement activity also notifies, if something is leading to critical condition within a patient. This aids in providing immediate treatment to the client, if there is any issue which might seek instant medical attention. The patient who has blood pressure problem is kept under supervision due to these major factors. This also guides the physicians to decide the type of healing a patient requires. Prior to measure the blood pressure of a patient, you must check that the equipments should be functional, clean and sanitized. After that, you need to cleanse both of your hands correctly. Wish the client politely, every time you enter the room for providing them treatment. Give explanation to the patient that you are going to measure his/her blood pressure. Your first step is to check that the patient you are seeing must have blood pressure problem. Now, request the client to stretch his/her arms towards you. Wrap the blood pressure cuffs around the arm. Enclose a bit above than the elbow. Now, you have to find out the brachial artery. This artery exists in the point from where the elbow bends. Place the stethoscope’s bell on that artery and do not move it till you notice the digits in the dial. Now, grip the bulb and start pumping it. You also need to observe the cuff’s watch strictly. As you start pumping the bulb, the needle inside the dial also starts moving. When you find the needle lying in between 150 to 180 mmHg; you must stop pumping then. Now, you have to release the cuff’s dial and let the air slowly release, and you have to listen the pulse rate with the stethoscope. When you listen to the first pulse rate, write down instantly the level you find on the dial meter. The digits you will see are called the systolic pressure. This is the upper number, and you must note down on the top of the sheet. You must continually listen to the pulse rates, until slow downs. Then you have to write down the lower number or level which you find on the meter, while hearing the last sound. This is identified as the diastolic pressure, and you need to write it on the bottom. Once, you have successfully measured the blood pressure of the patient, you must also note down the results accurately (as directed by the physician) on the sheet. You have to record the systolic level over diastolic level. For example, while writing the digits, you need to keep the upper number (120) over the lower number (80), like 120 over 80. Again, you must clean the devices that you have taken into use. You may use Anti bacterial wipes for cleaning the devices. In the end, make sure you cleanse your hands after the process is done. What does the evaluator notices when you present this task? 1. Do you start the activity by conducting proper initial steps? Tip- Make sure, you conduct the activity by starting the things that you must do initially, like greeting the patient, explaining the task, etc. 2. Have you sanitized the stethoscope before taking it into use? Tip- Do not forget to cleanse the earpieces of the stethoscope with Anti bacterial wipes to avoid the germ contamination. 3. Have you make the patient comfortable by taking him/her into a restful position? Tip- Before starting this activity, help the client to get into a comfortable position by letting him/her sit or lie down on the bed. 4. Have you checked that is there any disturbing noise, prior to starting activity? Tip- At first, make sure that the patient room should be peaceful and the volume of the radio or television should be low. If not, then you need do it. 5. Have you picked the apt size of blood pressure cuffs for the patient? Tip- You must also choose the right size of the blood pressure cuffs to wrap it on the patient’s arms. 6. Do you apply the cuffs correctly on the patient arms? Tip- You have to apply the cuffs directly on the patient’s skin. 7. Have you found the correct artery on the patient’s arms? Tip- You have to find out the brachial artery on the patient’s arms to place the stethoscope correctly on it. 8. Have you done the pumping properly or not? Tip- Make sure you do the pumping in the cuffs in a proper way, as told by the instructor. 9. Have you checked and noted down the measurements properly? Tip- At the same time of releasing the pressure of the cuffs, you must observe the diastolic and systolic levels properly and note it down. 10. Have you once again checked the numbers? Tip- To check the accuracy of the blood pressure, in some instances, you might probably have to do the cross check by measuring the blood pressure once again. 11. Have you waited for one minute, before using the same arm to record the blood pressure of the patient? Tip- You must wait for at least one minute before recording the blood pressure again of the same patient? 12. Have you done the measuring process accurately? Tip- You need to measure and record the patient’s blood pressure accurately, as the evaluator will compare the digits of the measurements taken by him with your digits. 13. Have you end the process appropriately? Tip- Be sure, that you have executed all the necessary steps in the end, before you leave the patient’s room. Prior to going for the CNA skills examination, you must practice this skill for a number of times. 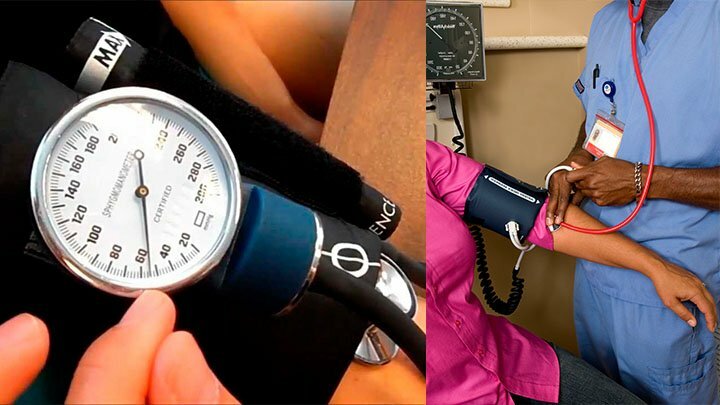 Many of the healthcare facilities are nowadays using automatic blood pressure takers or automatic cuffs to measure the accurate blood pressure of the patients by applying it on their wrists. Still, some of the facilities are using manual reading system for recoding the blood pressure. In any case, you must know how to use the manual cuff for measuring the blood pressure of a patient in the skill demonstration examination. So you must have sufficient practice for that. You should not take the task of recording the blood pressure lightly. It is quite hard, as the students get nervous while performing this task and hence this increases their heart beat. So, at the time hear the pulse rate of the patient, they cannot listen to it clearly. While performing this test, you must block all the noises coming from outside. If anyhow, you are not able to get the heart rate clearly, or if you have any doubts, you may also request the assessor to offer you one more chance. In many instances, the assessor allows you to get the readings right and give you many chances till you give up. Because, they understand it’s normal to be nervous and hence, they show their support towards such students. Do not ever give any fake readings to the examiner, because the examiner takes the results by measuring it themselves. If they find any fallacy in the results, they will fail you immediately in the exam. So do not give any false measurements. Once, you pass the examination and get a work in a nursing home as a CNA, never ever skip the activity of blood pressure measurement because it is an imperative process under which every patient needs to go on a daily basis. Do not ever write any fake digits in the medical chart of the patient, as this can make disastrous consequences.